“What’s going on?” Rob yells back to me, “Why are you …” then it hit him. I could see it in his eyes. Was it surprise? Horror? Water started to gather at the base of his eyelids, “Oh my God, I CAN TASTE IT!” he screamed. I was watching from a boat last night, and although it was rather early yet, we saw probably 10 that were absolutely spectacular! Just something to do with a bottle of wine after a day of riding the Harley, practicing with the Remington and pllaying with the dog. What was that about getting a life? Say, now that's talent. Turning a meteor shower into a political thing. Wow. You forgot to tell us to only P in a lead lined room so the govt won't watch our willie. 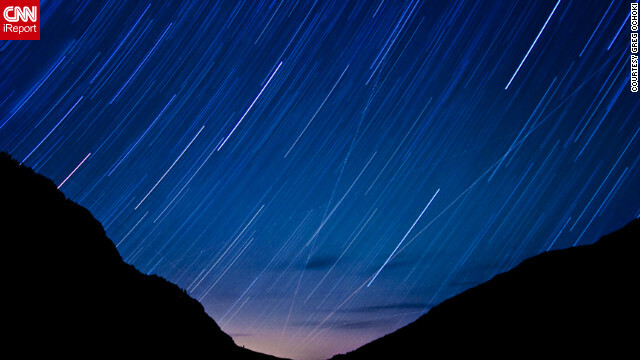 Last night's meteor shower stunk. I saw only 1 meteor. I was pretty cool though. I was outside from 10:40 to 11:30 and only 1 meteor. Very sad. You understand thus considerably in relation to this topic, made me individually believe it from a lot of varied angles. Its like men and women aren't involved unless it is one thing to accomplish with Girl gaga! Your personal stuffs nice. All the time take care of it up! Hello very nice website!! Guy .. Excellent .. Superb .. I'll bookmark your website and take the feeds also?I'm glad to seek out numerous helpful information here within the publish, we want work out more techniques in this regard, thanks for sharing. . . . . .
Somebody essentially assist to make severely posts I'd state. This is the very first time I frequented your website page and thus far? I amazed with the research you made to make this actual put up incredible. Excellent process!